Your tresses deserve the best treatment. We’ve looked everywhere for the best flat iron for black hair, and you’ll find the full list from our researchers below. Flat-ironed or pressed hair can be something you do from the comfort of your own home. It just takes a good iron at the right price point and level of professional quality. We’ve taken the time to detail all of the features you want to look for when shopping. Ready? Let’s get started! Hair - Good flat irons for black hair can tackle hair that’s thin or thick, although there are some marked as better for a certain type. Below, we will specify which kinds of hair a particular flat iron can be used on effectively. 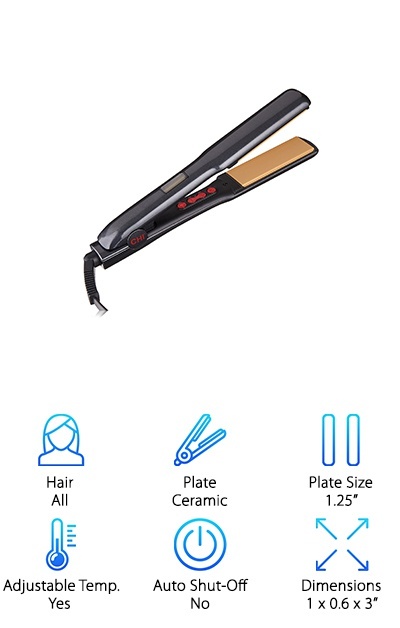 Plate - Hair-straightening irons are generally made from a select handful of materials, and you might prefer one over the other. We’ll tell you if the plates on a flat iron are made from ceramic, tourmaline, titanium, or other types. Plate Size - The plate size you choose should correspond to the length of your hair. In general, people with shorter hair will want a more narrow plate. We’ll tell you each flat iron’s plate size to help you make a decision. Adjustable Temp - The top flat irons for black hair sometimes come with additional settings, including an adjustable temperature knob. You might prefer a flat iron that’s plug-and-go! Just check below to see which type of iron is listed and reviewed. Auto Shut-Off - The busy mom, the executive, the on-the-go entrepreneur… there are plenty of people who could benefit from the automatic shutoff included with certain flat irons. If you don’t need it, great! Either way, we’ve noted it here for you. Dimensions - Flat irons come in all shapes and sizes, and the plate size you require will change its overall bulk. 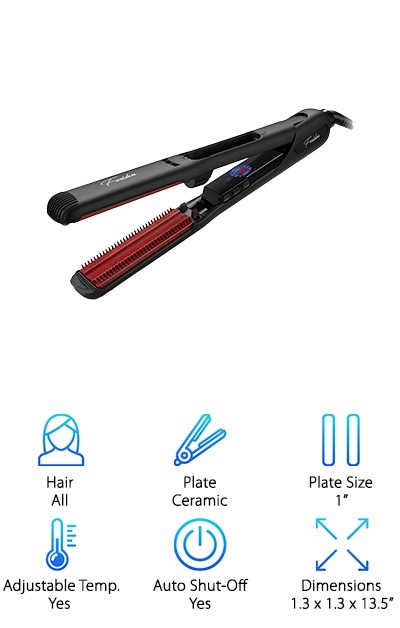 A quick glance at this final category will help you determine the size of the flat iron you’ve got an eye on. Now that you know the various things to look for when shopping for that perfect flat iron, we can get going! Picture this: salon-quality straightening power, with an iron made to take on natural hair. The professional tool of your dreams is right here! Our reviewers have picked their top ten, but if you’re in a hurry, just check out our top pick and our budget pick. Both are wonderful options, and favorites of ours. Let’s get started! Do you struggle to tame your springy coils? Is coming up with something to do with your wavy locks leaving you lost? The best flat iron can come to the rescue. The CHI G2 Hairstyling Iron is our top pick for quite a few reasons. Here’s the scoop: It’s made for every type of hair! That means if you’re dealing with a particularly coarse mane, or limp tresses, this iron can help. Its 1.25-inch ceramic and titanium plates are a good width for longer, medium, and even shorter hair. In fact, it comes with temperature-setting buttons and a temp display. The LCD screen will let you know what kind of heat you’re dealing with, up to 425 degrees Fahrenheit. 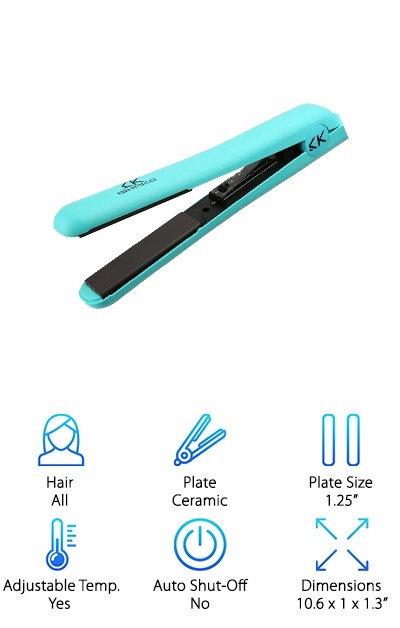 CHI products have a great reputation, and you might find it’s the best flat iron for coarse hair thanks to these flexible features. Fire up that iron, set it to the right temperature for you, and show off that brand-new do! Need a more “electric” look? We have one of the brightest options on the market for our budget pick. Get this: the Herstyler Ceramic Flat Iron comes in 5 eye-popping shades! Choose from pink, purple, red, green, and blue. There’s something for everyone here. In addition to the Herstyler’s snazzy appearance, there’s lots of other stuff to love. It’s as flexible as many of the more expensive choices out there, featuring a long cord that swivels 360 degrees. It’ll keep you detangled in more ways than one! Then there are the 1.25-inch ceramic plates, which float. No, not on water; these plates can shift slightly to allow for more flexible movement as you style. Multiple heat settings let people with all kinds of hair pick between temperatures of 180-460 degrees Fahrenheit. Go from “eeek” to chic with this magic wand! They say diamonds are a girl’s best friend, but we think a good flat iron can put up a solid argument. Do you need to shake things up on top of your head? 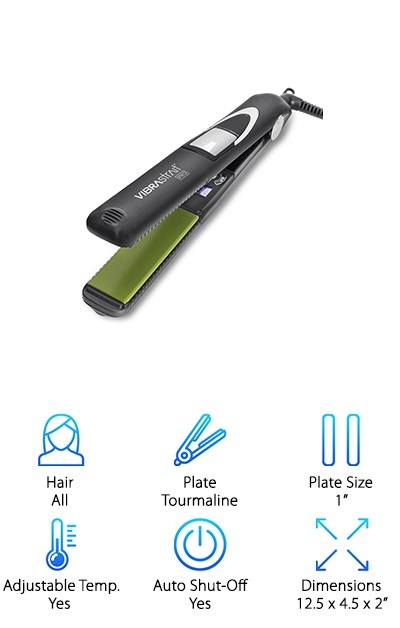 Let us explain: the VIBRAstrait Oscillating Flat Iron will shake it up for you. Its innovative vibrating technology moves hair as it heats and sets, ideally leading to a hairdo with less damage. You might be wondering: could that work for me? With 7,500 oscillations a minute, it’s worth a try! We could all use a little push when trying to mix up our look. Whether you need inspiration for work, play, or a hugely successful career in modeling, the right hair-styling product gives that much-needed “oomph.” The 1-inch tourmaline plates work for both shorter and longer hair. Additionally, there are multiple heat settings so that you can pick a temperature between 190 and 450 degrees. 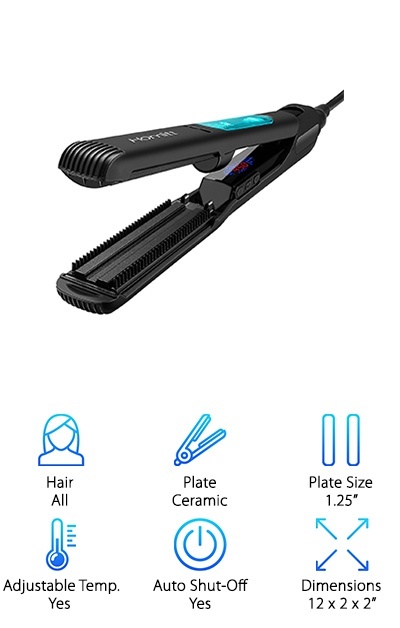 If you forget this flat iron on the bathroom counter, it’s got a built-in safety setting that will turn the device off after less than an hour. We’re all trying to save time. We get our coffee in the drive-thru, we scarf down energy bars on the go, and we mix whites and darks in the laundry (even though that fuzzy bear on the detergent is giving us a disapproving look.) 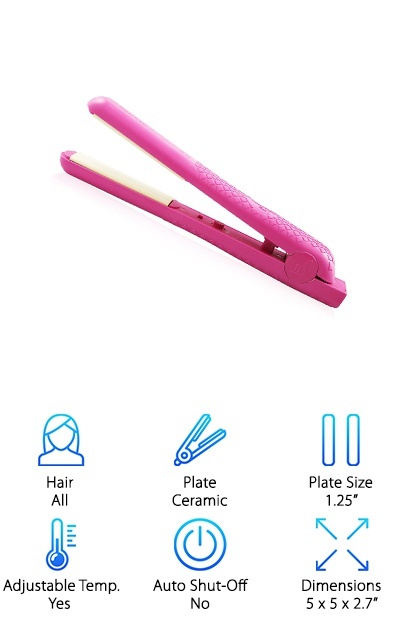 How about we introduce a flat iron that heats up to 450 degrees… in less than a minute. Yes, it’s possible! What’s the secret? The temperature memory function. Press the “M” on the straightener, and it immediately goes to 390. Keep pressing the (+) button if you want it higher than that! You can also take the temp lower. 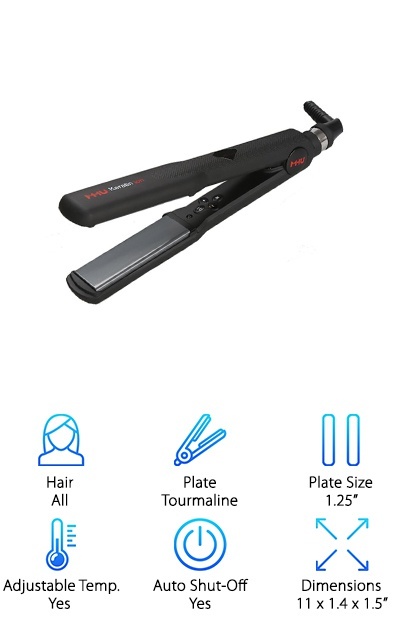 The best flat iron for thick hair should include generously-sized plates, and the MHU Tourmaline Straightener has the width you need for curly, thick locks. That tourmaline also offers a great advantage for people with more difficult hair. It’s been shown to provide great results even with less heat, which is why our reviewers love it. Sometimes, a regular flat iron just doesn't do the trick. The most texturized hair might need something extra, and that's what the Homitt Steam Flat Iron offers. Rather than simply using heat to smooth and straighten, the Homitt uses the power of steam. What is steam power, you ask? Just like a steam engine powers a train by pumping the pistons, the heated water infiltrates your hair and powers your hot new look. Speaking of heat, a heat-resistant glove, a clip, and a cleaning brush are also provided. The 1.25-inch ceramic plates are adjustable for temperatures between 355-450 Fahrenheit. The straightener will also turn itself off after 30 minutes with a built-in safety mechanism. This is a sturdy, innovative device for the tightest spirals! Just fill the blue water tank on the side of the steam iron, heat, and you’re ready to go. A more relaxed look could be waiting for you, so check out this recommended iron today. Thick, natural hair can be hard to predict at times. Getting it under control can be challenging. Make your hair more predictable with a device like the Xtava Infrared Hair Straightener. It’s built for precision, and it might be just what you’re looking for! Tame thick hair with the 2-inch tourmaline plates designed for providing even infrared heat. You can choose from 10 different heat settings in a range between 265 and 445 degrees Fahrenheit, one of the widest ranges available. In fact, it’ll be quite easy to keep track of your setting choice, since it’s displayed clearly on an LCD screen. 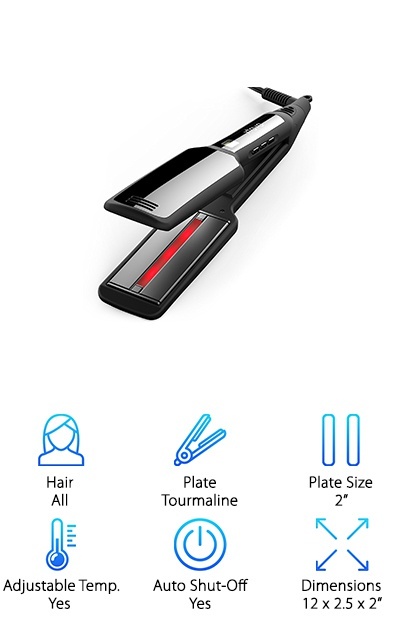 Our reviewers liked that this flat iron works quickly, and has a built-in automatic shutoff of one hour. The heat-resistant travel case means this straightener doesn’t need to be stranded at home! It gets better: universal dual voltage means that with an adapter, the Xtava can head overseas with you. Beautiful hair will no longer be a foreign concept! Cinderella’s fairy godmother waved her wand, and that sad housemaid was transformed into the belle of the ball. She went off to find the love of her life and live happily ever after. It can be tough to find magical moments like that in everyday life, but it’s not impossible. 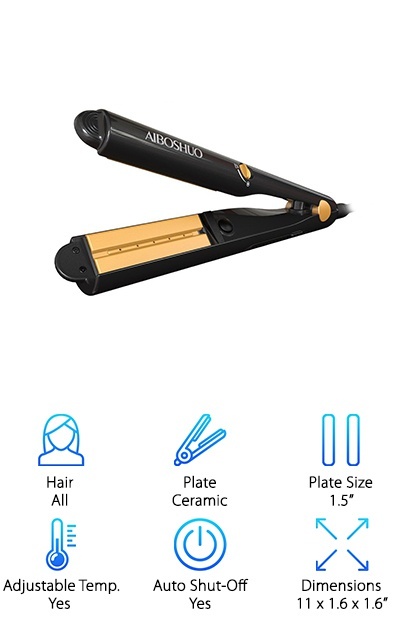 Think of the AIBOSHUO Steam Hair Straightener as your very own magic wand! It’s built to combine pure Argan oil, steaming hot water and ceramic straightening technology that is all then infused into your hair. Admit it: that sounds more like a fancy spa treatment than an at-home styling device! The AIBOSHUO also comes with a unique twisted design so that you can curl your hair, or add casual waves. Choose from temperature settings between 350 and 430 degrees Fahrenheit. There’s a built-in safety feature that will shut the straightener off after an hour. Fragile hair, coarse hair, thick hair, and thin hair can all be shined and smoothed. You want a hairstyle that stands out – so start with a flat iron that’ll do it with flair. The ISHAKO Flair Iron comes in three neon-bright colors: hot pink, purple and turquoise. It’s created for hair of all kinds, lengths, and thicknesses! So, what are we talking about? 1.25-inch ceramic plates that can heat up quickly in a range between 140 and 450 degrees Fahrenheit. In general, the higher the temperature, the better the results for thicker, more coarse hair. The device’s flexible heat range means you can find the exact setting that works for you! The plate width means both short hair and long hair can be pressed and smoothed. Hair styling at home can be intimidating until you find the right tools. The ISHAKO Flair Iron could be exactly what you need to drop those expensive salon visits once and for all. Instead, spend that money on hair accessories for your fantastic new style. In old commercials and films, when someone got a big idea, their hair would suddenly stand straight on end. Their brilliance shot through their follicles, resulting in a hilarious, slightly “electrified” look. Nowadays, we try to avoid that look whenever possible. We want to be brilliant, sleek, AND shiny. We can’t make you any smarter, but we can help with the shiny part! Check it out: the Furiden Black Hair Straightening Iron is built to glide through your locks and get you the look you crave. How does it work? With steam release technology that helps return moisture where it’s needed most. There are also several heat settings to choose from, ranging between 350 and 450 degrees Fahrenheit. Select your temp, displayed on the handy LCD screen, and start styling. An auto shutoff function keeps you safe. Our reviewers loved all of the different ways this straightener works to get you ready to go. Now, that’s smart! The flat iron can deliver results that a blow dryer cannot. Stylists know this is true, which is why they always have both ready to go at the salon. Here’s the great thing: you can now afford to do the same! Select a flat iron like the KIPOZI Titanium Flat Iron, built for all kinds of hair. The 1.75-inch titanium plates offer even heat distribution and go up to a wide range of temperatures. Go as low as 170 degrees and as high as 450 degrees Fahrenheit, depending on your hair’s thickness and health. This is a lightweight, more compact hair straightener, making it easy to manipulate and use. You can pretend to be your own stylist in the privacy of your bathroom. It also has that all-important automatic shutoff feature. Tackle frizzy, unmanageable hair and transform your look! The KIPOZI Flat Iron is worth a try for anyone interested in revamping their glam routine.